Because you think he's worth it, award him this 'Best Dad Ever' message card. 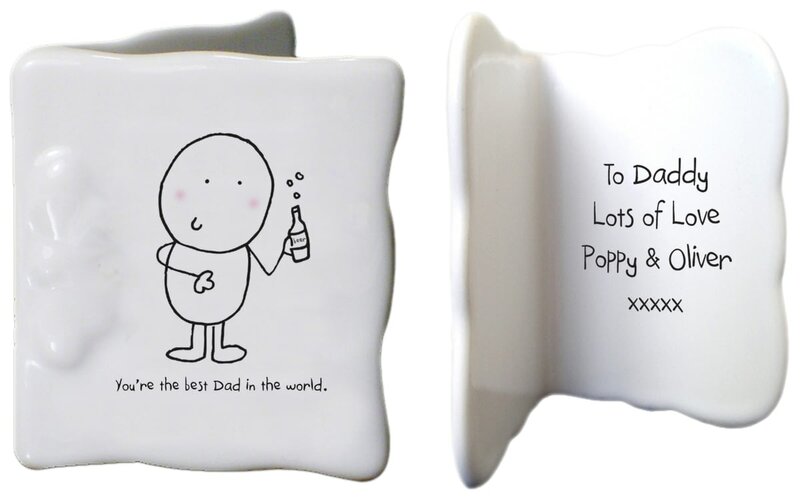 Featuring half of the cheeky duo Chilli and Bubble and a one-line message, the message card is personalised with your message for Dad. This will last much longer than any Card. In Stock, Dispatched in 3-5 days + delivery. Looking for a leaving card that lasts longer than the average? Give this unique bone china one instead! Stars and sparkles are the perfect way to congratulate a special someone, and with this china card you can celebrate in style. Looking for a Birthday card that lasts longer than the average? Give this unique bone china one instead! Looking for an engagement card that lasts longer than the average? Give this unique bone china one instead! Looking for an anniversary card that lasts longer than the average? Give this unique bone china one instead! Looking for a Valentine's Day card that lasts longer than the average? Give this unique bone china one instead! A gift for a friend who helped you through a tough time, for a boss who supported you, or for Mum who's always been there. Looking for a Wedding day card that lasts longer than the average? Give this unique bone china one instead!